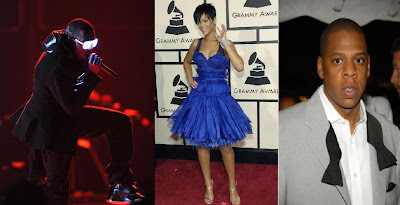 Superstars, Rihanna, Kanye West and Jay-Z will be performing on the premiere of Jay Leno's comedy and chat show in September, according to Reuters. NBC said on Thursday that the trio would perform "Run This Town" from Jay-Z's new album, "The Blueprint 3," when "The Jay Leno Show" makes its debut on September 14 at 10pm. It will be one of the first, major public performances for Rihanna, 21, since she was assaulted by Chris Brown who it is rumoured that she's actually back to dating again...(hmmm). Leno told reporters this week that his show would have more comedy and less chat.